From action-packed movie scenes to the police officers surveying traffic for speeders, radar is omnipresent in our lives. We all know what it is, but what exactly makes it work? In a way, the process is very similar to how your eyes see — but we’ll get to that in a second. 3 How does it do that? 4 But my eyes can’t see everything — can radar do that? The roots of radar technology can be traced back to the work of 19th-century German physicist Heinrich Hertz, who found that certain objects (most notably ones made from metal) can reflect radio waves. However, technological constraints of the time meant that his findings weren’t used to build a working device until the early 20th century — in the form of Christian Hülsmeyer’s Reichspatent Nr. 165546 or “Telemobiloscope,” a device used to avoid ship collisions in fog. In essence, this patent had all the makings of modern radar, albeit in a very primitive and incomplete form. 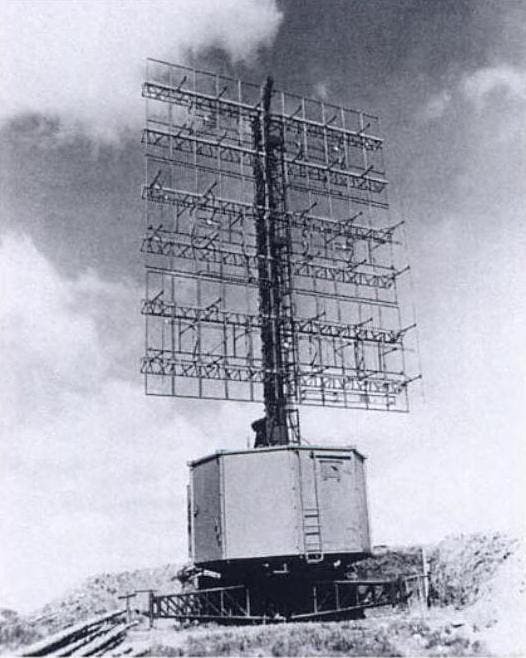 Modern radar was developed during the second world war. The word “radar” is an acronym which stands for radio detection and ranging, and it does exactly that — the device uses radio waves to determine the relative direction and distance at which an object can be found. This technology had great military potential and so, during the conflict, several nations developed radar systems independently and in great secret from one another. The term was coined by the US Signal Corps when it was developing the system for the Navy. After the conflict, radar technology was released for civilian applications, and it has changed our lives ever since. A German WW2 FuMG 401 “Freya” radar installation. Image via The US National Archives and Records Administration. Today, this technology unites the world and lets us explore farther than ever before: it allows our planes to fly and land safely in any conditions and helps our ships navigate and avoid crashing each other. Meteorologists use radar to track weather phenomena and give accurate forecasts. Astronomers use it to peer into the depth of space. And it’s not only used to cover huge distances and detect massive ships or planes — NASA uses radar to scan the launch pads at the Kennedy Space Center to make sure there aren’t any birds present that might cause accidents. Biologists use it to track birds and insects migratory patterns for their studies, civil engineers use it to track structural defects in buildings, and geophysicists use a specialized radar antenna to study subsoil. A radar view of Hurricane Rita. It was reported that the radar tower was destroyed by the storm. Weather radar tracks precipitation in the atmosphere by the intensity of reflected signal. So how is radar able to do all these amazing things? Again, in broad strokes, radar works similarly to the human eye — but there are some key differences. For you to see something, light has to travel from a source to an object, reflect off of it, and then be picked up by the cells in your retina. Although radar uses electromagnetic waves outside of the visible spectrum (radio waves) instead of light, it still relies on the same wave-reflect-capture process. Radio waves travel at the same speed as light but have the lowest frequency of the spectrum (meaning they have the longest wavelength). Light has wavelengths of about 500 nanometers (about 100–200 times thinner than a strand of hair), and the radio waves used by radar typically range from about a few centimeters to a meter, so they’re about a million times longer than light waves. Purple light has high frequency and short wavelength, while red light has low frequency and longer wavelength. Another key difference is that radar doesn’t always stay in capture mode, as the human eye does — it also emits its own signal, acting first as a source and then as a receptor of radio waves for fractions of a second at a time. While light continuously enters your eye, radar “sees” in short bursts while it records the return signals. Let’s take the example of an air traffic control tower on a foggy night. The operators can’t see the planes overhead because it’s too dark, and they can’t use a flashlight to peer up at them because of the fog. But radio waves can pass through the fog — the radar emits intermittent pulses of radio waves then “listens” to pick up for the return signal that bounces off of objects within its range. By measuring the time between the emitted and returned signal it then determines where the reflectors — and, thus, the objects — are located, thereby helping them land the planes. Radar can be used to determine the distance, direction, direction of travel, and altitude of an object. If a reflector is massive enough — think shorelines here — radar can even make out its shape. Doppler radars (the ones the cops use in their radar guns) can even tell an object’s speed by analyzing the difference between the emitted signal and the one that returns to the device. 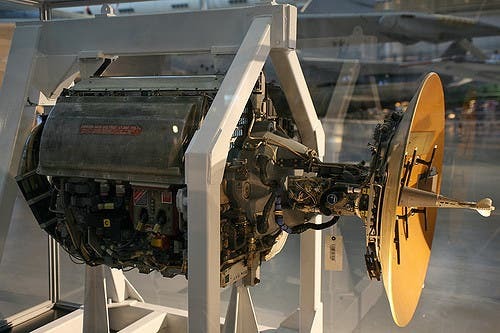 No matter what it’s going to be used for or where it’s going to be installed, all radars are formed from the same basic set of components: a device used to generate radio waves, something to emit them, something to receive them, and an interface to display the information to an operator. A piece of equipment known as a magnetron is used to generate the radio waves employed by the radar system. It actually produces microwaves (which are very high-frequency electromagnetic waves) very similar to those your microwave oven churns out but are much more powerful since they have to travel vast distances. 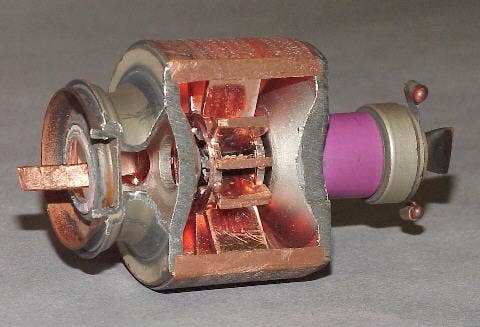 Cavity magnetron with a section removed. The central cathode is not visible. The waveguide emitting microwaves is at the left. The magnet is not shown. Image credits HCRS Home Labor Page / Wikipedia. An antenna first acts as a transmitter and relays these waves in a focused direction — the antennas are usually curved to focus the beams into a narrow beam. 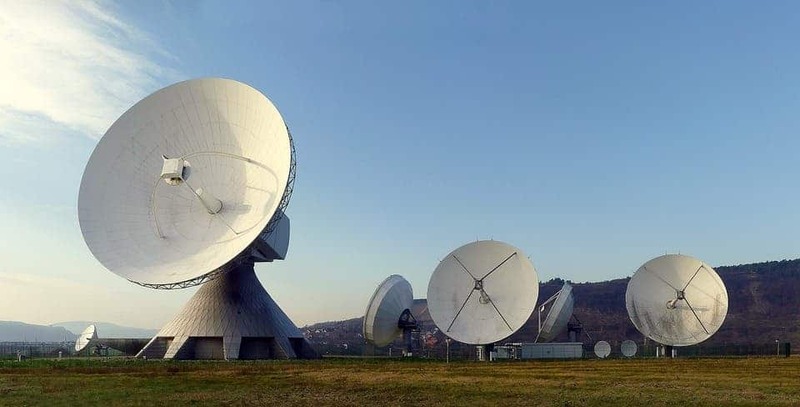 Usually, these antennas are affixed to rotating platforms so they can be used over a wide area. The waves travel at the speed of light until they hit something and then return to the antenna at the same speed (this reflected beam is sometimes called an “echo.”) This is what allows radars to detect even fast-moving objects at long ranges. Because the energy travels at the speed of light both away from and towards the antenna, it can travel a distance of 100 miles (160 km) in just thousandths of a second. The AWG-10 radar, designed for the F-4 Phantom fighter jet in 1963. The dish in the front is the antenna. Image credits Cliff / Flickr. During this time, the antenna switches from an emitter to a receiver — usually, antennas emit radio waves for a few thousandths of a second, then wait for reflections for up to several seconds at a time before transmitting again. This is because an antenna cannot recieve whilst emitting, and vice-versa. A piece of hardware known as a duplexer switches the antenna between these two roles. The waves picked up by the antenna are fed to a computer that processes them and displays them in a way that an operator can understand — these are the blips you see on Hollywoodian radar-green screens, and the line is the orientation of the antenna. This step also involves filtering out surplus information (or noise) such as reflections from the ground, buildings or other elements that don’t need tracking. While the Phantom’s antenna was meant to guide missiles at the front of the fighter, this one is used to cover a much wider area. But my eyes can’t see everything — can radar do that? No. By definition radar requires an echo to be formed by an object so it can detect it, so surfaces that absorb radio waves or allow them to pass right through can’t be picked up by these systems. Military research has also shown that certain fuselage shapes tend to redirect radio waves as opposed to reflecting them, which would make a vehicle, airplane or ship partially or fully invisible to radar. 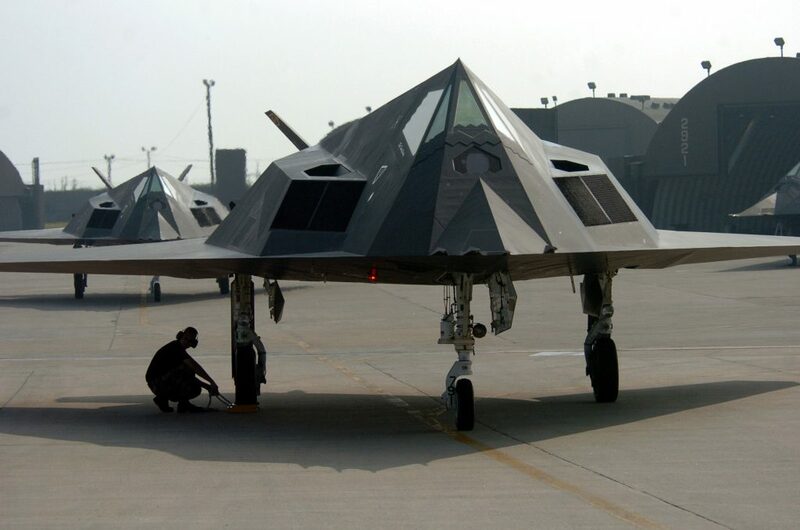 The Lockheed F-117 Nighthawk’s many-angular surface helps deflect incoming radio waves. Image credits Master Sgt. Val Gempis, U.S. Air Force / Wikipedia. 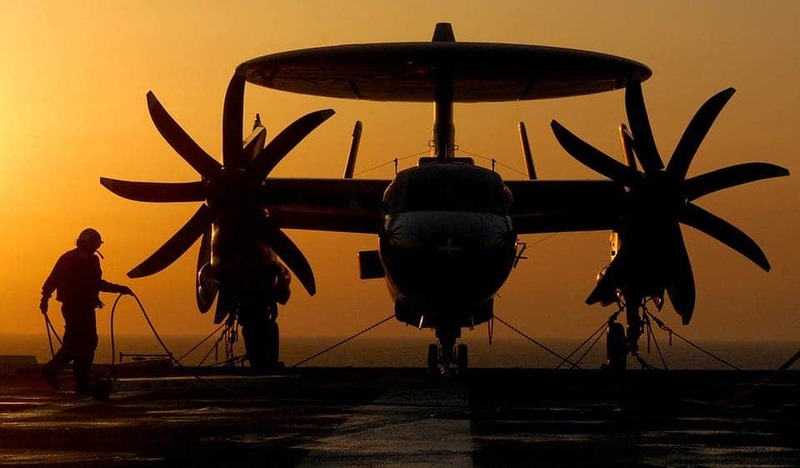 One other trick you can use to avoid radar detection is to fly close to the ground, which is known to airmen as a nap-of-the-earth run because an airplane flying very close to the ground could avoid detection by using the terrain as cover from incoming radio waves. It’s a very dangerous maneuver, putting the craft at risk from crashing into the terrain or power cables. Another disadvantage is that the crafts become very easy to spot from the ground — helicopters perform NOE crafts at a few meters above the ground, while jet fighters usually stay at about 50-60 meters in altitude. Also, while concentrated radio waves can pass through objects that light can’t penetrate, processing the echo back into any meaningful information is extremely difficult, although we’ve seen some fruitful efforts in this area. So in theory, large enough slabs of concrete could mask an object from radar — although the huge chunks of concrete would be pretty conspicuous, as well as heavy, so that kind of defeats the purpose. Phew, that was a long read, but the next time a cop pulls you over for a speeding ticket, start explaining how his radar gun works. Who knows, you might wiggle out of a fine.